Gain from a dedicated team, massive industry competence and complete infrastructure available at the ABB Corporate Research Center in Sweden. We are continuously scouting new members and are estimated to on-board around 40 of the world’s top notch startups as SynerLeap members each year. You will begin with a 6 month Aspirant Membership to start testing your ideas, concept and technology in what we call a hunting phase where we will support you to find a suitable receiver within ABB where your offer could be applied. After your Aspirant Membership there is a possibility to extend your membership and become Full Member. The aim is always win-win for all parties involved. Get our support to identify a collaboration project inside ABB. 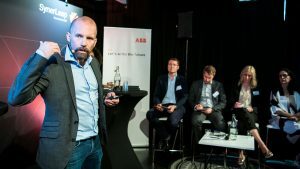 A strong willingness to collaborate, both with ABB, other startups and with our external eco-system. If you think a membership in SynerLeap would be valuable for your startup, please fill in the form below.